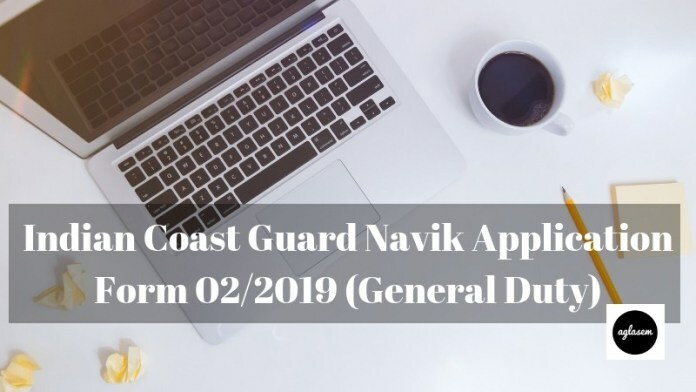 Indian Coast Guard Navik Application Form 02/2019 (General Duty) – Indian Coast Guard (Ministry of Defence) has released the Application Form of Indian Coast Guard Navik 02/2019 (General Duty) on January 21, 2019. The online form has been made available at the official website i.e. www.joinindiancoastguard.gov.in. Candidates can fill up the Indian Coast Guard Navik Application Form 02/2019 (General Duty) before or till January 31, 2019. 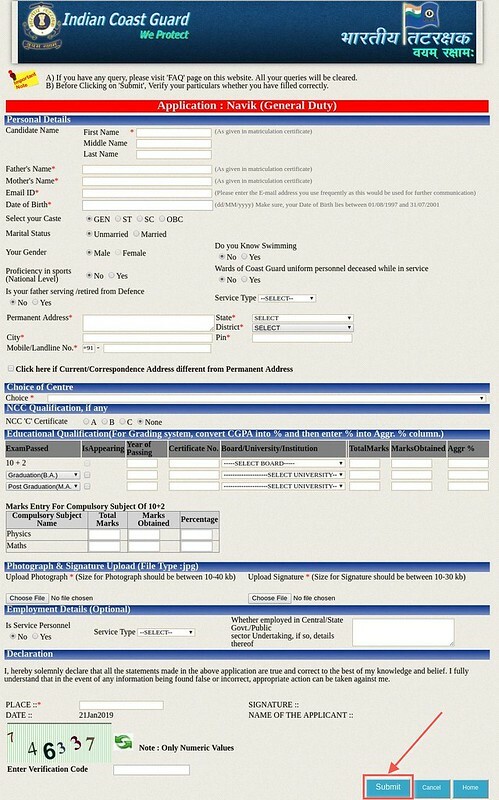 From this page, candidates will get full information regarding Indian Coast Guard Navik Application Form 02/2019 (General Duty). Latest: Indian Coast Guard Navik Application Form 02/2019 (General Duty) has been released, Scroll down to check the same. In the application form candidates need to fill the valid details in the application form. For more information regarding Indian Coast Guard Navik Application Form 02/2019 (General Duty) check the schedule given below. Apply Online: Click Here to Register for Indian Coast Guard Navik 02/2019 (General Duty). 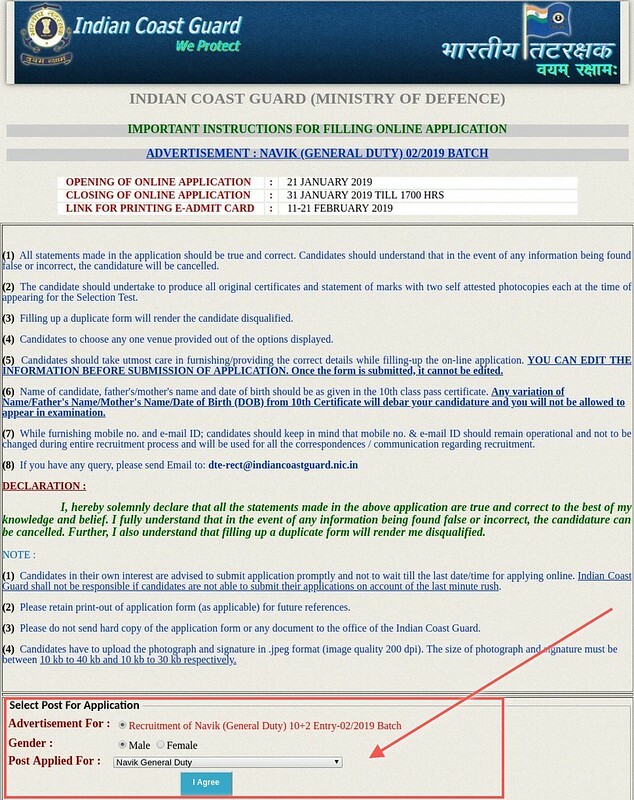 How To Fill Indian Coast Guard Navik Application Form 02/2019 (General Duty)? The candidates can follow the steps given below for filling the Indian Coast Guard Navik Application Form 02/2019 (General Duty). After filling the application form candidates should take the print out of it for future reference. Thereafter, the instruction page will open read all the instructions and Select Post For Application and click at the I Agree button. Thereafter application form filling page will open. In that page, candidates need to fill and upload the following details- Personal Details, Choice the Center, NCC Qualification, Previous Attempts, Educational Qualification, Employment Details, Photograph & Signature etc. After filling all the details click at the Submit button. Important Note: On successful submission of the application form, application/registration number will be provided to the candidates. Candidates must note the application number as it will be needed at the time of downloading the admit card. While uploading the photograph and signature candidates should follow the below-mentioned criteria otherwise it may be possible that while uploading scanned photo and signature error occurred. Photograph and Signature should be in jpeg. Image Quality should be 200 dpi. The Size of Photograph should be between 10 kb to 40 kb. The Size of Signature should be between 10 kb to 30 kb. Candidates should not use all CAPITAL Letter in Signature. First name 1st letter and Second name 2nd letter should be on the CAPITAL Letter. Go through the information given below before filling the application form. Candidates will find the given information useful while filling the online application form. Kindly ensure the eligibility for the post, before applying. After submitting your online application form, please wait for the intimation from the server, DO NOT press Back or Refresh button in order to avoid error. Take a printout of the system generated on-line application form, assure the particulars filled in the application form are accurate. Always remember your Registration Number and Password for future reference and it will be needed for downloading other recruitment particulars. The candidates who will submit the application form before or till the last date for those candidates only admit card will be issued. The admit card is the key to enter in the examination hall. The admit card will be made available on the official website. Admit Card will contain name of the candidate, roll number, examination center, exam center code, exam timing, exam name etc. On the day of the examination it will be mandatory for all the candidates to carry a hard copy of the admit card and one valid photo id proof (aadhar card, pan card, voter id card, passport etc).